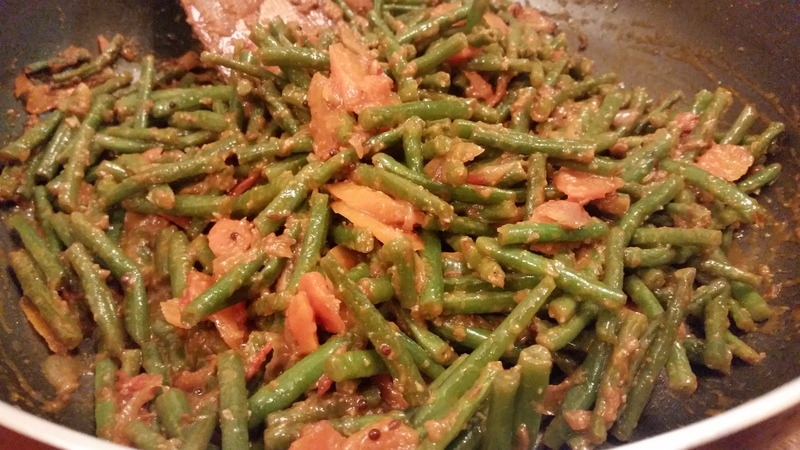 Green Beans is a very versatile ingredient and can be cooked in various ways. Steam, blanch, braise, roast, sautee – they really adapt well to different cooking techniques. They are good source of antioxidants and cartenoids apart from being a powerhouse of Vitamin K. I picked up some lovely organic green beans from Waitrose after work, it was trimmed already and made them on one weeknight. I love the ease of using pre-cut vegetables at times. Here’s a simple recipe of making them Indian style, I have just substituted the usual potato with carrots and given it a tangy twist. 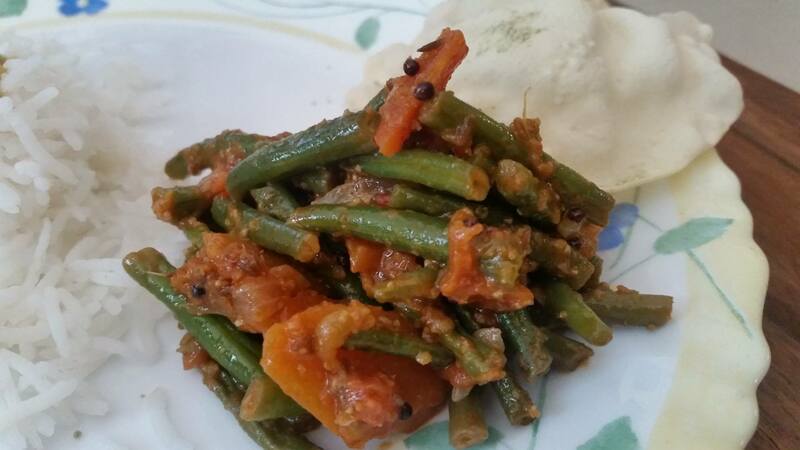 The dish came out quite saucy and I served them with a side of Surati Dal and steamed rice. Blanch the trimmed beans in boiling and salted water for a couple of minutes. Drain them while they still have a bite to them. In a wok / wide pan, heat the oil and add mustard seeds, cumin seeds. Once they splutter, add green chillies and follow it up with onions and garlic. Once onions have browned a bit, add the chopped tomatoes and cook them for a few minutes. Add the carrots and sauté them until they have slightly softened. Add beans followed by all dry spices, salt, tomato and tamarind paste. Cook until the mixture is well coated and just about to leave a ring of oil on the sides. Remove off heat and serve with fluffy rotis or dal-rice. Until next time, happy cooking! i’m always looking for a new way to use green beans, will try this!